The Puzz & Go is the perfect workspace and storage solution for puzzlers, with an easy to use assembly board and six essential sorting trays for sorting your puzzle pieces. When you are finished puzzling, lay the included foam pieces over each sorting tray, place the assembly board on top of them and place the included large foam piece over the assembly board. Then just snap the lid closed to keep everything secure. Sturdy cardboard outer case with heavy duty plastic sorting trays. Assembly board measures 51cm x 71cm. Outer case measures 76cm x 56cm x 3cm. For jigsaws up to 51cm x 69cm. Weighs 3.63kg. Never stretch for hard-toreach puzzle pieces again. Pop out the reinforced support legs for a free standing table or place flat on a table of your own. Our exclusive custom designed tilt-up table features a generous 64cm x 86cm work surface to accommodate standard 1500 piece puzzles, or work on your favourite hobby. Raise the specially treated non-slip felt covered working surface, with the wooden easel on the back and have a comfortable experience assembling your puzzles. A masonite cover is supplied to secure your puzzle in progress with swivel clips to secure it in place. Quickly folds down to a compact 90cm x 67cm x 9cm and secures with a metal pin, to store flat under a sofa or in a closet. Made of New Zealand pine. Instructions included. 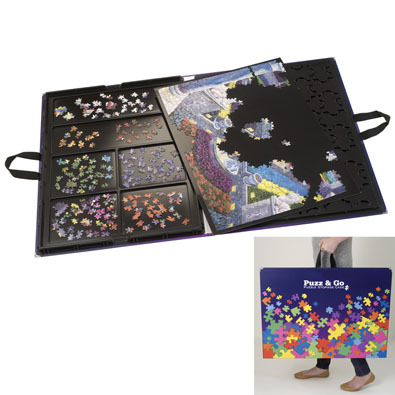 Our original Stack-Em Puzzle Sorting Trays allow the dedicated puzzler in your life to organise pieces by colour, theme, border, and keep them categorised while working on assembly. When it is time to take a break, simply stack the trays on top of each other for neat space-saving storage. Set includes six colourful trays with one clear plastic top. Each tray measures 20cm x 15cm and sits 11cm tall when fully stacked.